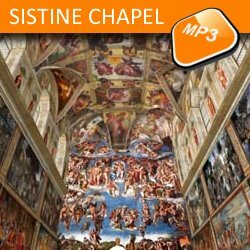 Description: The Sistine chapel (Cappella Sistina in Italian) is located at the southern end of the Vatican Museums and at 5 minutes walk from St. Peter's Basilica. If we look it from the outside, the Sistine Chapel is of no great architectural interest. The chapel has a rectangular shape and measures 41 x 13 meters (134 x 43 feet) and was built using ordinary bricks. The chapel is 20.70 meters high (68 feet) and has a barrel-shaped roof. As we said, there is nothing spectacular about the building itself. All its beauty is in fact on the inside amazing frescos.